Which donkey client/mod are you using and why? 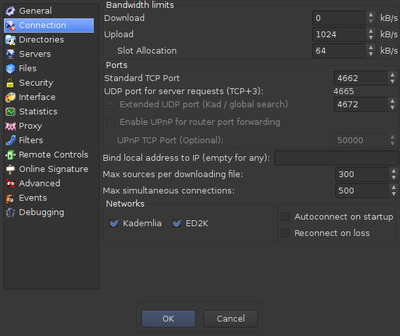 Does anyone know of any eMule mods that let you set the bandwidth per upload slot (ie. number of slots for total upload bandwidth)? ZZR is still my mod and yes its a leecher mod but it gives extra possibilities for pushing releases and banning leechers. What's the definition of a leecher mod? A leecher mod has additional features mostly to push one's stats up. Mldonkey (MLNet) 3.1.0 because it's the only eDonkey client working with my Qnap Nas. I see on your profile text that you've changed to aMule, how do you like it? Has anyone tried it, and what do you think? I must have forgotten to change that profile information, cause it was for a very short time I tried aMule. I can't really remember the details, but mldonkey has been working flawlessly on my Qnap from day 1, so as long as I have that unit, I'm sticking with it. Last edited by Cyence on August 9th 2017 - 2:48 pm, edited 1 time in total. lol, fair enough. I tried mldonkey briefly, but it seemed too simple for me. I guess I'm used to the traditional view of the mules. v0.50a eMule !! working fine here !! !